“I quite liked the buns Witch made last year. Would you mind if I re-published her recipe? ” he asked. “I’ve never cooked a thing in my life, you know, the kitchen was Grandma’s domain. God bless her” he added. Granddad Max produced a print-out of the recipe from his pocket, smoothed it out, and started to edit what Witch had said. And then she made it. But something wasn’t quite right. The dough was too dry and Mouse had to add a little bit more water. “What happened here? Did you ever try your recipe?” she asked Witch. “But with a yeast dough, it is easier to add water if necessary than to add flour” Witch defended herself. 2.5 cups of flour, 1 cup of warm water and 1 teaspoon of dry yeast. Pour flour into a bowl, make a well in the middle and add half the water (make sure the water isn’t hot, as hot water kills the yeast) and add the yeast. Let sit for at least 15 minutes so the yeast becomes active, which you can see when it foams. Add the rest of the water and knead to a dough, first in the bowl, then on the bench. Knead very thoroughly for five minutes. Put the dough back in the bowl, cover with a clean tea towel and put in a warm place to let it rise until it has doubled in size. In a cooler place this process will take longer, but it will happen. After an hour or so knead again. It doesn’t need to be as long as the first time, it’s just to get the air out. Then let rest until it has noticeably risen again. Preheat oven to 200 0C. While the oven is heating up, knead the dough one more time and divide into 8 balls. Place the balls on baking paper on a tray (I use a silicon mat as it can be reused again and again) and let it rise again. 10 minutes should be enough or until the oven is properly preheated. Whenever i look at the felt mittens on the Dedes I wish my P&J fellas had the same. Their mache hands look good but are quite difficult to manipulate, grasp things, etc. – – easier to knead dough though, I imagine Dedes hands get quite mucky when baking. Mr Punch is far too impatient to bake and wouldn;t be bothered with such things. Judy, however, when she is not up on stage dying to the audience is an excellent housewife, though she can get a little violent too – neither of that pair are inhibited about showing their emotions. I really recommend to Judy to take up bread making. Kneading the dough releases a lot of tension. Instead to hitting Punch, she might want to try pan cake making and beat the batter. 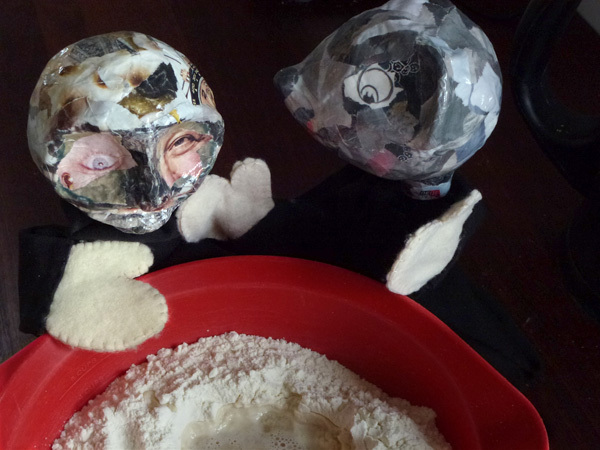 Yes, the Dedes have to wear gloves when they knead the dough, their hands would be up to it. How are your shows going? Not too badly thanks, there is a hiatus whilst the canvas tent-maker gets around to repairing some of the covering and the booth pack-bag. It’s interesting how much damage a single performance does to the puppets. I shall have a word with Judy about the pan cakes. We might all benefit. I have seen a Punch and Judy show and was surprised it didn’t cause an earthquake. There was a lot of hammering going on. So I am not surprised that the puppets suffer.